The bowlers of the Royal Challengers Bangalore managed to stem the flow of runs and restricted the Rajasthan Royals to 130/9 in their stipulated 20 overs. Earlier, The Royal Challengers Balngalore's skipper Virat Kohli won the toss and elected to field first. The host side, Rajasthan Royals' opening pair captain Shane Watson and the Orange Cap holder Ajinkya Rahane were put into bat. The partnership between the two gave Rajasthan a flying start of 36 runs in the first five overs, but India's middle-order mainstay Ajinkya Rahane was soon dismissed by Harshal Patel after scoring 18 runs from 12 balls. After his dismissal, skipper Shane Watson was accompanied by his compatriot Steven Smith. As the partnership started to build between the Aussie duo, the skipper failed to survive for long and was caught near the boundary line by Mitchell Starc on Yuzvendra Chahal's spell. Despite the top batsmen getting a start, the middle and lower order crumbled badly. The batting line-up of the Rajasthan Royals collapsed soon and they only managed to put a below-par score of 130 on the board. For the Royal Challengers Bangalore, with big names like Chris Gayle, AB De Villiers, Virat Kohli and Dinesh Karthik on their side, the small total of 131 seemed to be a walk on the cake affair. Unexpectedly, the Gayle-storm didn't attack but soon after the man from the Caribbean's dismissal, the partnership of 98 runs for the second wicket between the Royal Challengers' skipper Virat Kohli and the South African bloke AB De Villiers led to a second victory for the tourists' side. The Rajasthan Royals' bowlers had no answers for the duo. Overall, the Royal Challengers Bangalore's reply was a stronger one and they managed to rule in all the facets of play at the Sardar Patel Stadium by breaking their three consecutive losing streak. Skipper Virat Kohli scored his second half-century in this season of Pepsi IPL with an unbeaten 63 runs by utilizing just 46 balls. 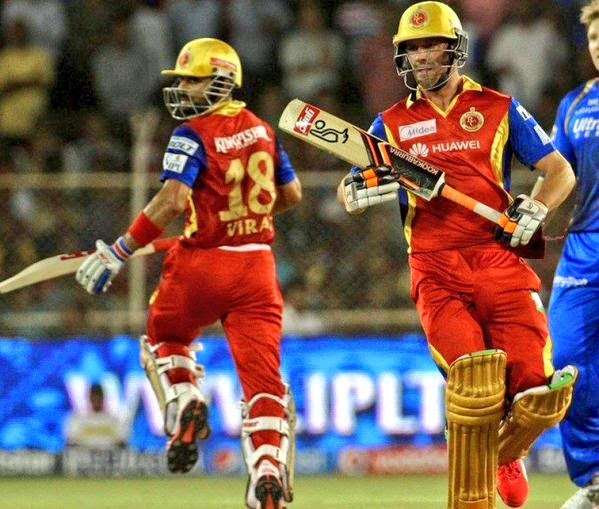 De Villiers also projected a fine display of his unbeaten knock of 47 runs from 34 balls. The Man of the Series of the World Cup 2015 Campaign, Mitchell Starc won the Man of the Match title for his stifling bowling as he ended with 3-22 from four overs. 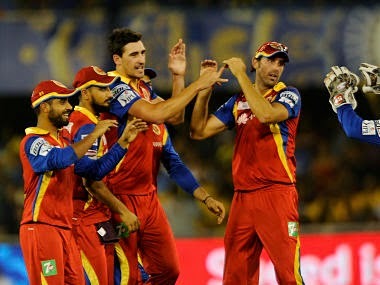 This match didn't affect the Royals much, as they still are the table-toppers but surely the win for the tourists against the host side helped former to swap the position with the Kings Eleven Punjab, the Royal Challengers Bangalore have now moved upwards at number 7 in the Points Table.